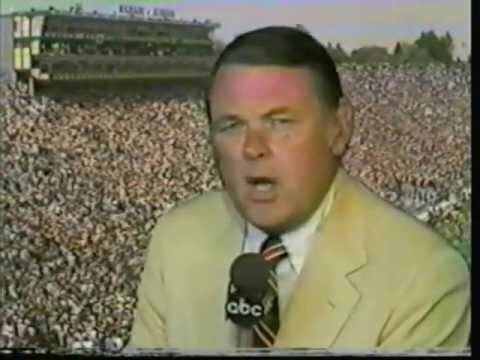 Keith Jackson will always and forever be the voice of college football to me. Jackson worked many different sport broadcasts including ABC's Wide World of Sports, AFL and USFL pro football games, MLB, the Olympics, the NBA, even college basketball. But to hear him doing any sport other than college football, just felt wrong. Keith coined the terms "The Big House" and "The Grandaddy of Them All". To me, he'll best be remembered for the 1997 season, where he seemingly commentated almost every Michigan game that year with his cohort Bob Griese. It was great to see him sign on to host BTN's "Big Ten Icons" a couple years ago. No one could've done it better. You always knew that when Jackson was in the booth, your ears were in for a special treat. The man could describe the game with a substance and flare that no one since has been able to mimic. He truly is one of college football's special treasures. Via YouTube's own Wolverine Historian. Who else?! Enjoy!